WHAT IS A GARAGE KIT? This goes back to the roots of the figure modeling hobby as we know it today. In my mind’s eye, the story goes something like this: It’s the 80’s. Some guys who grew up building Aurora’s classic figure kits in styrene looked around and decided that they wanted to see some of their favorite characters from movies, comics, and the like made into model kits. They picked up some clay and began to sculpt their own. They took the sculpts and made silicone molds into which they would pour two-part resin plastic to produce kits they could sell to or trade with fellow enthusiasts. These cottage industry productions were carried out in the basements and garages of these brave pioneers. Hence the term "garage kit." As the years passed, the hobby grew. It already existed in its own form in Japan. Japanese and American producers became more and more savvy and professional and the hobby emerged from a solely garage-based set of ventures and sprouted some larger operations. These companies had names like Billiken, Horizon, Screamin, and Geometric. Many of the early companies invested in metal molds and cast their kits in vinyl rather than resin. But the whole time, the garage operations continued and the name "garage kit" stuck even when people were referring to kits produced by these larger operations. Today, these big companies aren’t around any more, and few new vinyl kits are produced. But the hobby is far from dead. We have gone back to the future in a way – back to smaller resin operations. However, today’s sculptors and casters, thanks to the natural evolution of the hobby, are much more sophisticated and use techniques the pioneers never dreamed of to produce outrageously accurate and detailed kits that are beautifully cast and a joy to build. You should appreciate that most of these operations, while capable of making very professional products, are operating on a shoe string. With all of the costs of production, these are usually break even type ventures where any profits simply go into producing the next new offering. In short, these operations exist because these small producers are fellow enthusiasts and love of the hobby; no one’s getting rich here and these are essentially individuals (as opposed to say, big nameless corporations). It’s an unauthorized copy of a kit. The copies are usually made of resin, but some well-financed re-casters (especially in Asia) are capable of making vinyl copies. In simple terms, recasting happens when unscrupulous individuals obtain an original of a kit and use it as a master to make their own mold and produce cheap knock-offs. These copies are referred to as "recasts." Recasts are ALWAYS inferior to the original kit. Just as a photocopy of photocopy is worse than a photocopy of an original, a recast of a kit is necessarily worse than a casting that comes from a mold made using the original prototype. Detail and crispness is always lost. Add to that the fact that re-casters don’t really care about the modeler, but only making a quick buck, and therefore do things like: use cheap materials (e.g., brittle, bad-smelling resin); do slip shod quickly casting jobs (e.g., resulting in offset seams, pin holes, and uncured spots); use molds that are worn out (silicone molds start to break down after a certain number of castings from the heat generated as the resin sets); don’t bother to produce unusual parts (e.g., white metal or vacuform plastic accessories); and don’t bother to produce box art or even include a box with the kit. What does the re-caster care if the modeler gets so frustrated building the recast that he decides the original kit producer makes crap products and vows never to buy another kit made by that producer, the re-caster will just steal someone else’s work. Some of the worst quality recasts of this sort are those that one cannot help but run into on E-Bay: those being sold by re-casters in Thailand, Singapore, and other places in Asia. There is a species of re-casters who will actually go the extra mile in a more sophisticated effort to fool you. That is, they will actually work hard at making a good mold and casting and go to the expense of copying the extras like box art and instructions. These re-casters however, are usually trying to pass the kit off as original and hence offer little discount off the producer’s price. These re-casters are particularly insidious and hard to identify, but producers are presently working on ways to help buyers do just that using various indicators of authenticity (e.g., special stickers, certificates of authenticity, etc.). WHY SHOULDN’T I BUY A RECAST? Sometimes modelers who are new to the hobby buy recasts because they just do not understand why buying one is a bad thing. The truth is, it’s bad for everyone involved (except the re-caster, of course! ): from the sculptor and producer right down to you the individual modeler buying the recast. Let’s start with the sculptor and producer. Sometimes these are the same person, but often a sculptor will seek out someone to produce the kit for him or a producer will hire a sculptor to render a character the producer wants to release as a kit. Among other things, these expert producers organize and promote a brand name (for example, Jayco or Needful Things), practice the arcane arts of molding and casting, and deal with packaging and sales. When you buy a recast you are taking money out of the pockets of these folks. Let me ask you, if you were putting your blood, sweat, and tears into sculpting the coolest piece you could or manufacturing a top quality kit (casting, instructions, box art, promotion and advertising, sales and shipping) of that piece with your only expectation being that you might make enough money to do another, how would you feel when some thief came along, made a cheap imitation and sold it a fraction of the cost because he had no real investment himself? After this happened to you a few times, you might well just decide to get out of the hobby. This is precisely the conclusion that many of the greatest sculptors and producers over the years have reached. Can you blame them? Why bang your head against the wall just to put money into the pockets of thieves? Of course, these thieves wouldn’t last long if modelers didn’t buy their recasts. The scourge of recasting has contributed to the demise of some very big name licensed kit producers, such as Screamin, Horizon, and Geometric, just to name a few. It has also driven away plenty of small resin producers – too many to name. 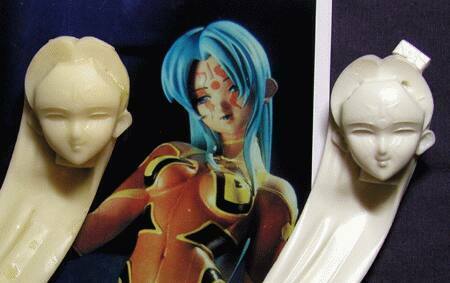 It has caused some of the greatest sculptors, such as Mike Hill, to stop producing garage kits. The loss of these and other producers means less for you, the modeler, to choose from. It also hurts the hobbies great magazines like Model Maniacs, Amazing Figure Modeler, and Modeler’s Resource which rely on advertisers in order to bring you the great articles on building and painting kits as well as reports on the newest offerings. If the producers quit, then the freelance sculptors are out of work because there is no one to hire them to create new sculpts. 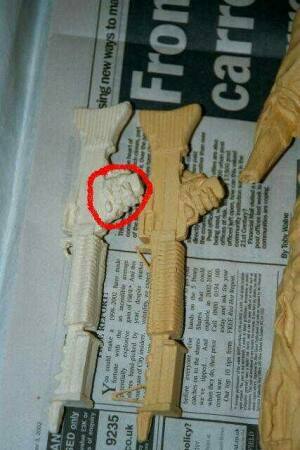 Also discouraged, those sculptors who produce their own kits then leave the hobby. After all these people are gone, there will be NO new kits being produced, so the re-caster will fade because he will have nothing left to copy and no one left to steal from. re-casters are parasites that have severely hurt our hobby already and could eventually kill it if left unchecked. Fortunately you as a customer can change all that. You can make an educated choice. If you choose not to buy recasts, you deny these parasites the money that draws them to steal the work of others in the first place. Even if you don’t really care about the re-casters’ effects on others, avoiding recasts is in your own best interest as a modeler for at least two simple reasons: (1) recasts are almost certain to be more difficult and frustrating to build up, which will make the process less fun and yield a build-up that doesn’t look as good; and (2) by supporting re-casters, you ensure less great new kits in the future and, indeed, may even contribute to killing off your hobby altogether. HOW CAN I TELL IF A KIT IS A RECAST? 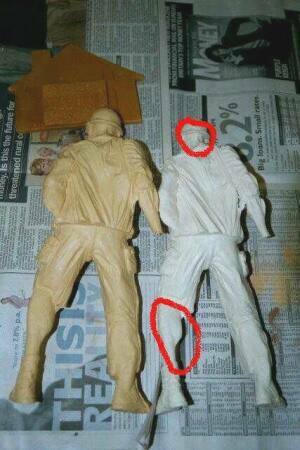 Some recasts are very easy to identify, others can be very tough to spot even for an experienced modeler. First, if the price is just way too good to be true, recast bells ought to immediately go off in your head. Second, inferior castings that are soft on detail, full of defects, have double seam lines, or are made of brittle or bad-smelling resin can be a tip off. Third, be wary of kits you know came in boxes originally that are being sold in plastic bags or plain black boxes. Fourth, be wary of most any kit coming from Thailand or other spots in Asia, other than Japan (Japan has plenty of legitimate companies and makes some of the best kits around). Besides trying to identify the recasts yourself, you can do some other things: First, just flat out ask the seller if it’s a recast. You’d be surprised how even though a given dealer knows it’s wrong, he’ll readily admit it – often with some excuse offered as a justification (e.g., "oh, that’s out of production anyway" (even if it’s not); "I just thought I’d serve the modeler since [the original producer] is asking too much money for its kits."). Tell them you won't buy it if it’s a recast. Second, ask the seller to identify the manufacturer and sculptor. Many times, they won’t even know! Lastly, if you are not sure, come to the ez-boards and ask for help identifying a kit. There are hundreds of people here from sculptors, producers and modelers who are well versed in this area and will be more than happy to help. Please just ask; it’s better to be safe than sorry. Doing a little research not only gives you piece of mind, but will also allow you to make new friends not to mention learning valuable modeling tips by frequenting The Clubhouse forums. Well for one thing, re-casters’ expenses are minimal. 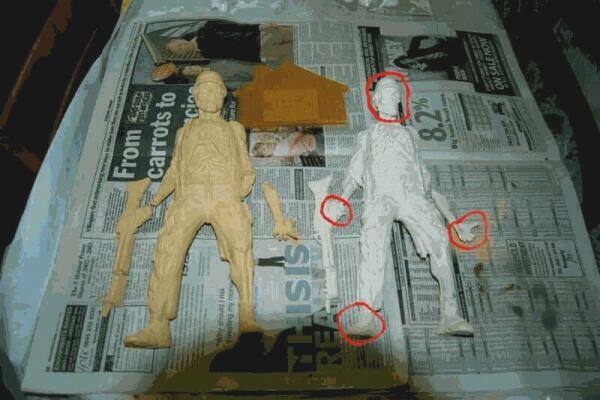 All they do is buy a kit, make a mold of it, and cast it up. They don't hire a sculptor who can charge from several hundred to several thousand dollars, and that’s just for starters. They also don't advertise or promote the piece through magazine ads, box art, boxes, certificates, or instruction sheets, which, of course, saves them a ton of money and allows them to significantly undercut the actual producer and still make a tidy profit. Garage kit producers seldom see a profit, and if they do, they just reinvest it in the next kit anyway. A garage kit producer will ask the customers what they would like to see and base many of their kit releases on that input, but not a re-caster. re-casters produce nothing original at all. WHAT IF I JUST CAN’T AFFORD THE REAL THING? We all want things we can’t afford. Is it all right to buy a stereo a guy is selling out of the trunk of his car and that you know was stolen just because you couldn’t afford to buy the stereo at Circuit City? No, it isn’t. Buying a recast is no different. HOW CAN I FIND THE REAL THING? So I can hear you saying, okay, I want to do the right thing and buy an original, but (a) I don’t know how to contact the producer or (b) find a retailer that sells the kit or (c) they stopped selling the originals three years before I got into the hobby and I have no idea how to find one. Let me tell you, searching for and finding "grail kits" is one of the joys of the hobby. Your best bet for finding kits of any vintage are other modelers. They can point you in the right direction or might be willing to part with a kit they have stashed in their closets. Check out web sites, and forums like the Clubhouse, or go to a convention/show. E-bay can be a good source for older kits, but is full of recast listings, so look out. Some folks think that there’s no harm to buying a recast of an out-of-production kit. Unfortunately, it’s still wrong. The original producer could always reintroduce the kit himself or sell the rights to another legitimate producer who can reintroduce the kit. But, no one will do a second run of nicely made kits if the market is already flooded with cheap recasts. Also, beware when a re-caster tells you a kit is out of production. It often is not, but rather still readily available form the original producer. Licensing is a separate issue. This hobby would not exist if universal licensing was expected. Even if you think it’s wrong for an artist to make a tribute to a licensed character and a producer to make 20 to 50 castings for the handful of modelers and collectors out there who want one, with no significant profit, does this entitle someone else to rip off the sculptor and producer? No. Another thing to consider is that, regardless of whether or not a kit is of a licensed character, the original sculpture is fully protected by the same copyright laws, and is owned by the sculptor or kit producer. WHAT ABOUT THE PRODUCERS AND SCULPTORS? Producers and sculptors are first and foremost fans of this hobby. They enjoy being able to take that moment in a film or character from a book, and through a combined effort, capture it forever in 3D through model kits. They give you the kits you crave, and they love to see your excellent build-ups of their efforts. Many sculptors who are just starting out use the garage kit market to gain exposure of their talents in the hopes of moving onto bigger and better jobs whether it be in film, special effects, or pre-paint statues. They can't do that without producers, but, of course, re-casters don't care. Many of the best figure toys made today, like Sideshow’s, or the pre-paint sculptures by companies like Dynamic Forces, Diamond Select, and Moore Creations can trace their lineages right back to garage kits. In some instances, toys or statutes are virtual reinterpretations of the best garage kits. In other instances, it’s the influence that comes from having guys who started in garage kits move over to toys, but keeping all that they’ve learned in the garage kit world about how to make cool figures. For example, Randy Bowen, of Bowen Designs and its hugely popular line of Marvel pre-paints and other statutes, started out as a garage kit sculptor for a company called Dimensional Design. Or Shawn Nagle, who now does a lot of great sculpting work for Diamond Select, started out as a one man sculpting, molding, casting, and sales operation in the world of garage kits. The same is true of kit painters. David Fisher, co-editor of Amazing Figure Magazine and the star of a line of Model Mania videos, started out as a regular garage kit modeler. In short, we have a very cool hobby here. It has influence well beyond its small circle of kit makers and builders. We must come together to support and advance this great hobby. We must protect it from the cancer of re-casters. Thanks for your help.